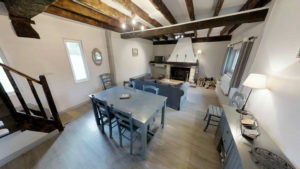 La bergerie is a self-catering cottage of about 120 sqm located on the property of Les Marronniers. 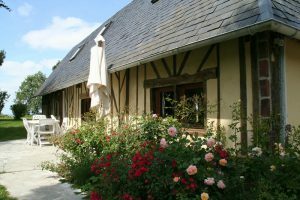 The gite is situated in Calvados, in the countryside, 12.5 miles (20 km) from the sea (Deauville, Trouville, Cabourg, Houlgate). 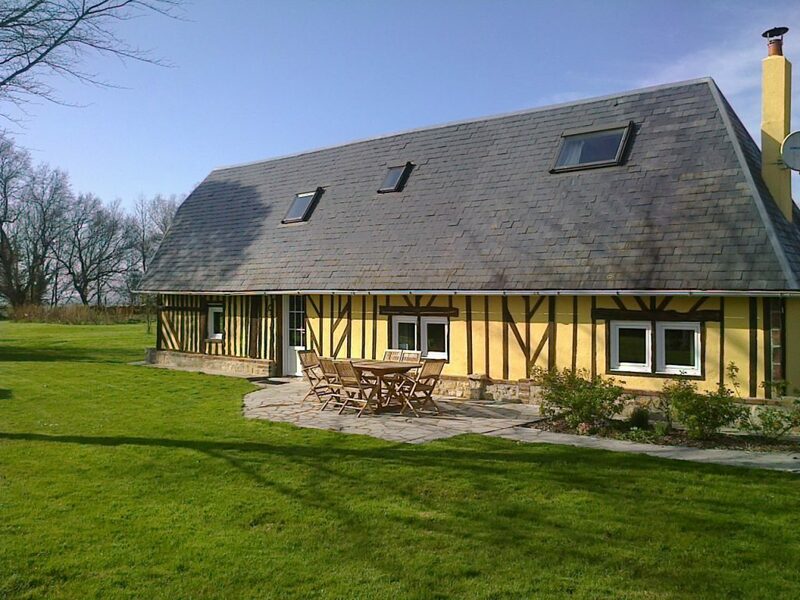 This Normandy country gite is rated 3 Epis by Gites de France. 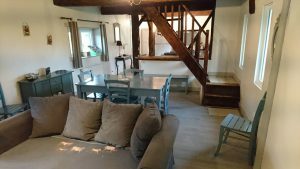 The cottage is situated a few yards from our house, in the grounds of the Domaine Les Marronniers. A hedge ensures everyone has privacy, peace and quiet, yet allows for easy relations throughout your stay. A calm environment surrounded by nature, in a region offering numerous activities and tourist attractions. 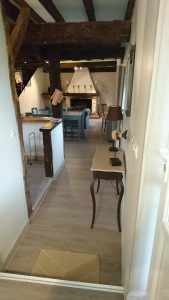 A spacious cottage with a restful decor. A fully equipped and modern kitchen. Lounge with log fireplace. 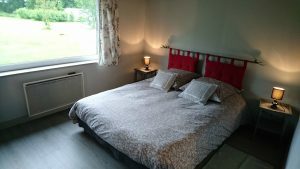 Very comfortable beds and bed linen. Beds are made before your arrival. Capacity : 6 persons, very good level of comfort. 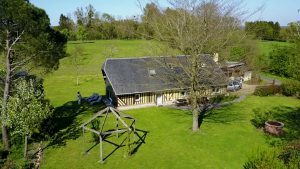 The cottage benefits from its own access, parking spaces, a bike shelter, and a private flourished garden with terrace of about 1000 sqm. 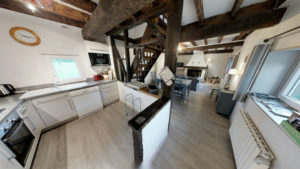 * a living room including table, chairs and sofas, a fireplace, a TV (bluray player). * Also: washing machine, iron and ironing table, vacuum cleaner, cleaning kit. Heating from electric convector heaters and radiant heaters. Electric water-heater of 220 litres. Bed sheets and dish towels supplied, bath towels not supplied. 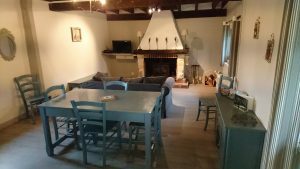 On the ground floor: kitchen, living room, separate toilet, bathroom with washbasin and bath, 1 bedroom with double bed (140 cm). 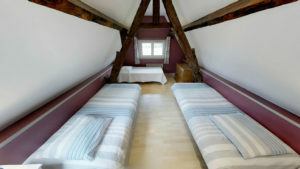 Upstairs (attic) : recess, one bedroom with a double bed (140 cm), one bedroom with two single beds (90 cm). 1 bathroom with washbasin, shower and toilet. Extra baby bed possible. 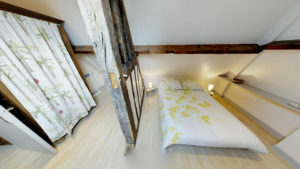 The bonus at Les Marronniers: we rent the cottage with the sheets… and make the beds! Breakfast service, packed breakfast and/or packed 1st dinner to save you doing the shopping on arrival, local produce hamper, catering service in collaboration with the village restaurant for your family meals, etc. Do not hesitate to ask for our help to facilitate your stay! 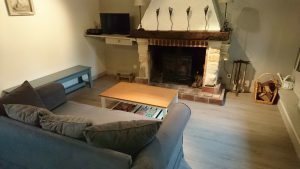 A huge space on ground level with a beautiful, restful and contemporary decor that respects the cottage’s history, and of course a comfortable sofa to enjoy the fires in the fireplace! 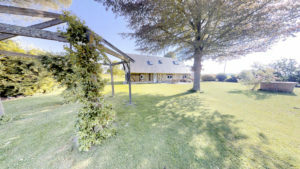 Three bedrooms, comprising two double bedrooms and one twin bedroom. 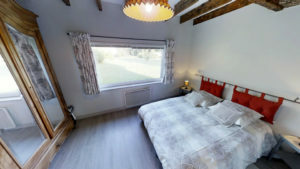 The bedrooms are all large enough to accommodate a spare bed for a child. 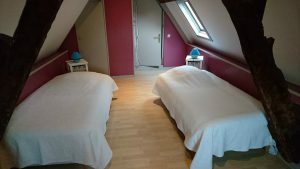 Ouistreham bedroom: ground floor bedroom with double bed (140 cm). An immense patio window gives a stunning view of the garden and Dives valley. 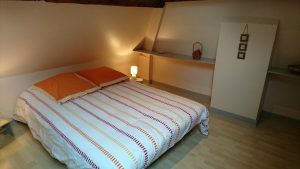 Etretat bedroom: upstairs bedroom with double bed (140 cm). Very spacious with drawers and wardrobe. 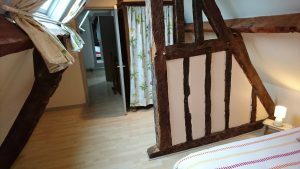 Bayeux bedroom: bedroom with twin beds (90 cm). Here, too, you will have a panoramic view of the Dives valley with its splendid sunsets and the garden from the window (with safety lock). 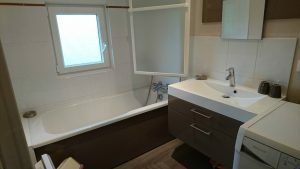 A large ground floor bathroom with bath and shower. Sink. Washing-machine. An upstairs shower room with sink and WC. A spacious hall practical for setting down bags and for storage. 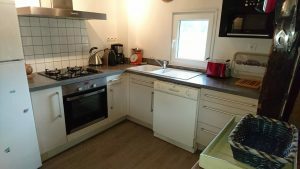 A brand new, fully equipped kitchen: double-door fridge, fitted electric oven, 4 gas hobs, fitted microwave, set of kitchen utensils, dishwasher, kettle, cafetiere, raclette grill, plenty of cupboards and drawers, ventilation, etc. . . . The open plan kitchen is very convivial and allows for everyone to take part in whatever is happening both sides of the counter! 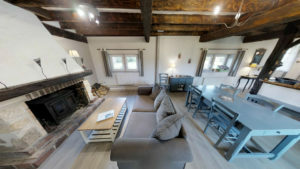 A lounge-dining room with a large table, comfortable armchair, benches, chairs, armchairs, coffee table, TV offering TNT channels by satellite, Blu-ray drive, log fireplace. A patio with garden furniture and barbecue. 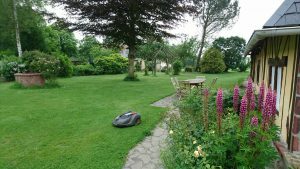 A large private garden. Independent access with parking space. 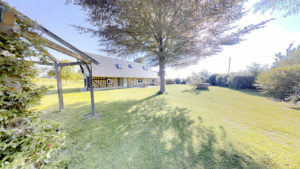 Direct access to the meadow and woods. The footpaths are within easy reach and children have space to play. The property is enclosed. But also and more importantly, what you will find here is . . . lots of peace and quiet! Arrivals after 4.30 pm, departures before 10 am. It is compulsory to sign a contract prior to rental. A deposit of 25% is collected at the beginning of the month of rental. sheet rental – beds made, and cold water consumption. Electricity is charged as per the meter reading. Wood for the log fire provided. 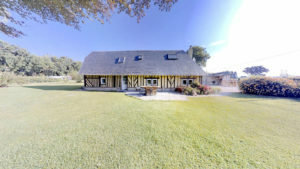 Additional guest over 6 occupants in the cottage: €80 flat rate for a week’s stay, €40 for a weekend stay. 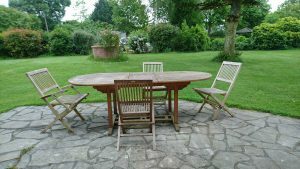 Breakfast service for cottage guests: €7/person/day. 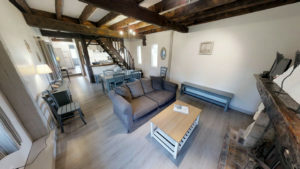 Extra charge of €1 tourist tax per person and per day is collected to the benefit of the Community of Communes of Cambremer.